This was Mr Knox's class in Ocean Road Senior School in 1956/57. Somehow, I have managed to lose the right third of the picture? If you hold down your Ctrl key and tap the - key a few times the photo will all be revealed. When you next upload a photo pick a lower resolution size in Photobucket. The photo which you loaded is 1024 X 735 which is far too large for a forum, ideal size is 640 X 480.
can you put names to any of them ? There are Pottingers in my family, they lived in Salmon Street, just off Ocean Road. Carol who is possibly his sister. The name is not very common, and so there is the possibility of a connection somewhere. My paternal grandmother remarried becoming a Scott and so I have connections with two families on that side. My dad sadly didn't keep in touch with either side and so though I am aware of the existence of some, most I have never met. One Pottinger family whose name I have come across over the years was that of Olly Pottinger (now dead I believe). Their name used to crop up in The Gazette in the old days, in connection with 'The Pier Pavillion' and 'The Westovians'. I never met any of them, but I have heard it said there is a distant connection - but if true and how, I haven't a clue. I have just read the bottom of your post again, I am Ralph with a sister Carol! Latest Update on that one, I believe the Salmon Street Pottingers to be the Olly Pottinger family, and one of his daughters is also Carol, but not the one that is my sister - there thats crystal clear then. To add to the confusion, I had a half brother, who died a few months ago, whose mother was Mable Smith - any connection there? Ollie (Olaf) Pottinger was a relative of mine, he was my dads cousin and they were very close. address in later years. Main surnames in my family are Smith of course, Scott, Gray and Pottinger. No Mabel in our side of the Smith family. So, if there are links, what they might be, we are no nearer knowing. I know that some years ago, living as I do in London, I spent some time at what was then St Catherine's House, where the records of births and marriages were then kept, and the Pottingers that I could find to which I was connected, seem to all have been in South Shields at least since just before 1837, with the inevitable marriage from outside of the area: for example a Willliam Pottinger (mariner) who had married a girl from Gainsborough, whose father was also a mariner etc. You say that you live in London, would that be in SW16 Streatham district? Yes SW16, There used to be another pottinger who lived a couple of streets from me too, but I never came across them. Not all Pottingers of course are related for here's an example: I was interviewing a man some years ago, a West Indian, and was quite surprised when on asking his name, he told me it was Pottinger. Seeing the amused look on my face, I told him that was my name as well, and I asked him if he knew where his family had got the name from. He told me that his family were decended from slaves, I think he said in Jamaica, and that the estate owners name had been Pottinger. He said it was common practice for slaves to take the family name of their owners! Famous Pottingers that I have come across: Sir Henry Pottinger, first Governor of Hong Kong. and George Pottinger, one time Government Minister for Scotland, who came unstuck in the Poulson Scandal, many years ago. I come from a very much more humble branch Also in Belfast, there is an area called Mount Pottinger, but where that got its name from I don't know. I tend to be a bit more casual since I retired 15 months ago, but have spent nearly all of my life wearing a uniform of one sort or another, and that tends to rub off in civvie dress I'm slowly learning to unwind dress wise, and enjoying the change. I'm coming up to Shields on the 24th, returning on the 28th and I'm looking forward to sitting on the hill-top, looking over to Tynemouth, and down to the Groyne, where I spent so much time as a kid, scrabbling among the rocks looking for crabs or small fish trapped in the rock pools. 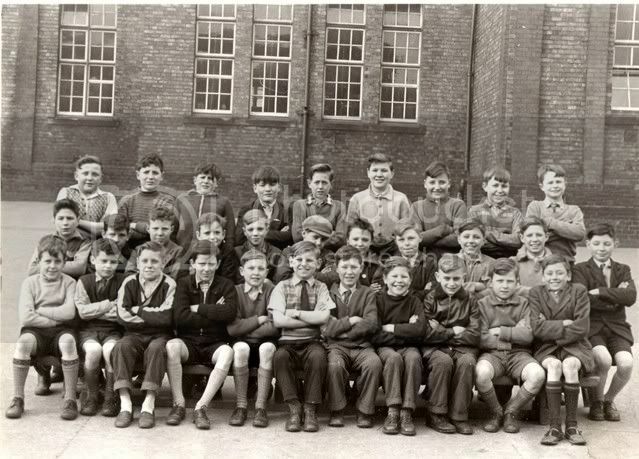 In those quiet moments, the years seem to slip away... Just as the people in the school photo have. If I met them today, we probably wouldn't recognise each other. A bit sad, isn't it? I knew an Alfie Coverdale who was skipper of the Pilot Cutter but he would be older than the one in the picture, maybe the father of the lad in the picture, I also know a Peter Middlemass who is a Compass adjuster but the one in the picture is older, maybe his father ! Pilot, you may well be right about Alfie Coverdale's dad. I asked mam, who is 92 this year and usually the fount of all knowledge on matters historical and she said that Alfie's dad may have worked on the cutter, but could say no more than that. She was certainly a friend of Molly, Alfie's mam, who lived in Fort Street. Last year, I was briefly in touch with Alfie, who I found on the 'Friends Reunited site. He lives in Yorkshire, where he has had a pet shop for over 40 years!. I never saw nor heard of Peter Middlemass after I left school. Speaking as you were, of an Alfie Coverdale skippering the pilot cutter, my nephew, Jeffery Burns is doing that job now. I had a look over the newest of the cutters a few months ago, and was astonished at how 'high-tech' they are these days. My dad was a foy boatman, so as a lad, I was always hanging around the pilot jetty, either swimming of the letter 'T' (perish the thought), or spratting. What happy memories. Its 10 years since I retired so I expect some of the skippers have started since I left, yes the cutters have changed a lot since I started in 1964. Hi Ralph, Do you remember playing in the 'chuggy'. Long time ago, but if I do, maybe you do, too. I lived in Baring St with my brother Albie and sister Jackie. Both dead now, sadly. Reading your posts brought back many memories. Living in Harrogate now, but think of Shields a lot. Julie, I saw this message years ago, just after you posted it and sent you an email. I never got a reply so you may have stopped using the site, but if ever you do revisit and see this post, yes I remember you very well indeed, and all of the kids from that time. I have lived in or near to London for the last 51 years but still 'come home' to Shields about three times a year.